We believe that we are valuable to any customer through the coffees we have to offer from Ethiopia, because of our selection process and what we value in the cup and because of the relationships we are always working on with the different types of suppliers we work with. The way our coffees have been displayed until now hasn’t communicated this to you in a way that can aid your decision making on the types of coffees you want to buy and have representing you. We both want to maintain transparency in what we do and communicate why we chose any one of the coffees we sell over the many others we cup through. 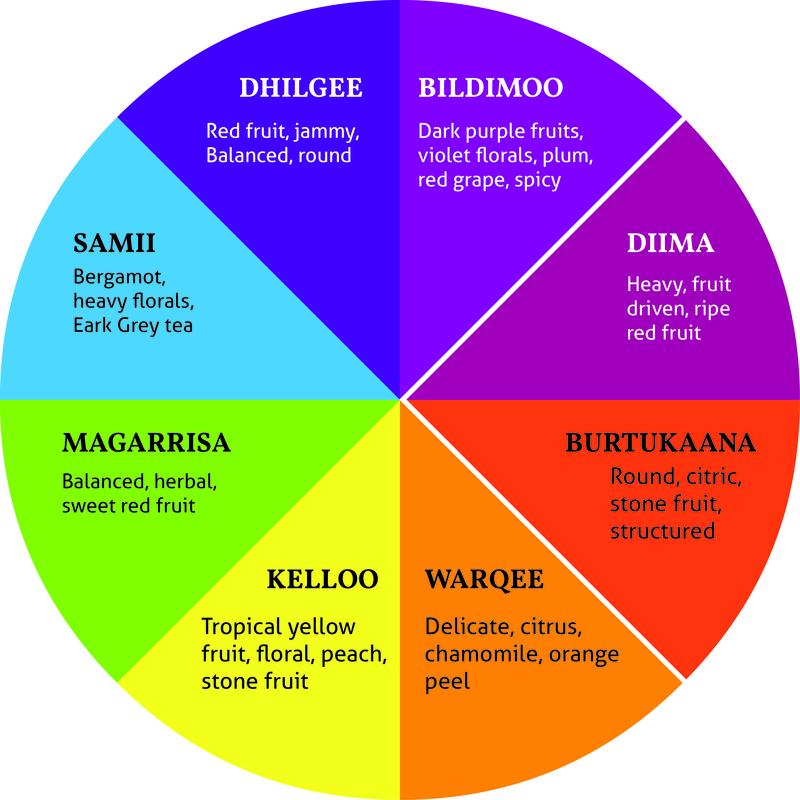 So we have looked at the kind of profiles we work with from Ethiopia, we have associated these flavor profiles to colors that make sense to us and we have created a color wheel of Ethiopian coffee profiles. Currently we recognize six different washed profiles and two different natural profiles that we find exciting and want to share when we are selecting coffees. Where the coffees we buy fit into these recognized categories we will label them accordingly, so it will be clear what you can expect in the cup. The coffees themselves will be different, from various suppliers and even different regions. You will still have access to all of this information with the added value of some insight into what that coffee will taste like. #3 is the complicated one. There are many private washing stations throughout Ethiopia, and since the start of the ECX, they must sell their exportable grades of coffee through the exchange. The ECX reduces the traceability to the sub-region, like Kochere, Guji, etc. Have fun with this PDF with different contract types! In many cases we are able to have good idea from which private washing station a coffee is from, but that will not be part of any formal contract as it is sold as a Kochere grade 1, Werka grade 2 etc. The ECX does a lot of good things for price transparency for your average farmer. But as of now it’s not specifically set up for the same standards of traceability that the specialty industry is used to in other origin countries. The result has been a lot of confusion — there are loads of Guji, Kochere, Konga and a bunch of other known coffees on the market, with various prices, flavor profiles, qualities, etc. All the coffees we select to import meet our quality standards, and we buy them for a reason — in the case of ECX coffees, that is 100% flavor, since we don’t always have a 100% traceability back to the individual washing station. So, we finally decided: why don’t we just name these coffees based on the main criteria, flavour? 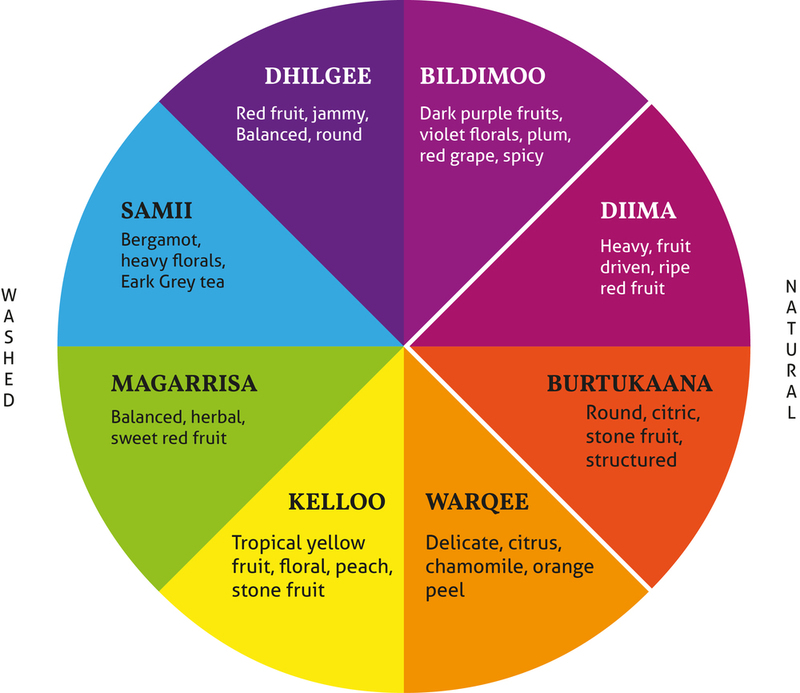 It is to this end that we created our flavor wheel however we are still giving you the maximum transparency based on the info we can get on these coffees, so each has the region included in the name of the coffee. If you’ve been using Kochere coffee in the past, and want to continue using the name, that is 100% reasonable and honest. In some cases, where we are working with producers directly and are able to show a greater level of traceability that is not made possible through the coffees purchased in the auction system in Ethiopia, we will not use our profile wheel. As we both want to recognise these individuals and the effects of their hard work on the cup profile of their coffees. We are also excited to think about the possibility that these coffees have unlimited potential in their cup profiles. The aim here is to better identify the kinds of coffee’s you can find from Ethiopia through working with us.